Producer – 4BC Morning Show. Journalist, ABC News North Queensland. In my first year at QUT, I reached out through friends to veteran Broadcaster Donna Lynch, who gave me a part-time opportunity working for her in the Promotions department at 4BC. I soon met the Program Director and started learning to become a Talk-Back Radio Producer. Once I had learned the ropes, I regularly picked up casual producing opportunities until the end of my degree. Donna also put me in touch with the team at Nine’s Gold Coast News, and I began a cadetship in that newsroom, working every Friday until I finished my degree. It was an excellent place to learn, from experienced operators like veteran Cameraman/Tech Mark Harahan and some very talented reporters, including Brett Mason, Alison Fletcher (now Ariotti), Natalie Gruzlewski and Mazoe Ford. On top of all that, during the final year of my degree I also started an unpaid cadetship on the sports desk at ABC News Brisbane. It was a struggle to juggle so much un-paid work with my studies, but it paid off. At the end of my final year at QUT, I was lucky enough to win the Andrew Bennetto / Channel Nine ‘Best Television Journalism Student’ award, which gave me a month-long internship at Channel Nine in Brisbane. That opportunity was brilliant, and I learned a lot from some very experienced veteran reporters and presenters. Soon after that, I secured a full-time job with the ABC, working as a News Journalist and Breakfast Newsreader for ABC News North Queensland. 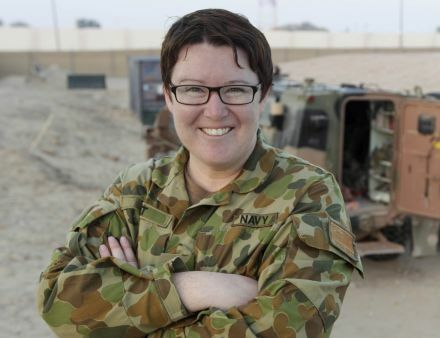 With Townsville being a garrison city, that job gave me a lot of exposure to the Australian Defence Force. After a few years, I made the decision to serve my country. So, I left the ABC and worked as a Freelance Reporter for Channel 7 in Townsville while I prepared to enter the Royal Australian Navy. I joined the Navy as a Maritime Warfare Officer and spent my first 2.5 years in the service training to drive warships as an Officer of the Watch. After that, I transferred to the Navy’s Public Affairs branch. Overall, I spent six years in the Royal Australian Navy. It was a job that took me to some amazing places – I literally travelled the world. I served on Operation Resolute (Border Protection Operations) and Operation Slipper (The Afghanistan campaign). I travelled to Antarctica on the Aurora Australis during the 100th Anniversary of Mawson’s exploration. Other highlights included flying onto a US Aircraft Carrier in waters off Hawaii, and serving as 2IC of the Media Management team for the International Fleet Review in Sydney Harbour in 2014. Since leaving the ADF, I have returned to NewsTalk 1116 4BC. I worked casually in the newsroom, online department and as a Producer, until a full time opportunity opened up. I also reported from the field on Election Night, and produced the G20 Weekend Morning Show. Then, when the decision was made to network the Nights show into Sydney on 2UE, I was appointed to the role of Senior Producer. Now, I have the privilege of being one of two Producers on the Morning Show, hosted by Journalist, Patrick Condren.